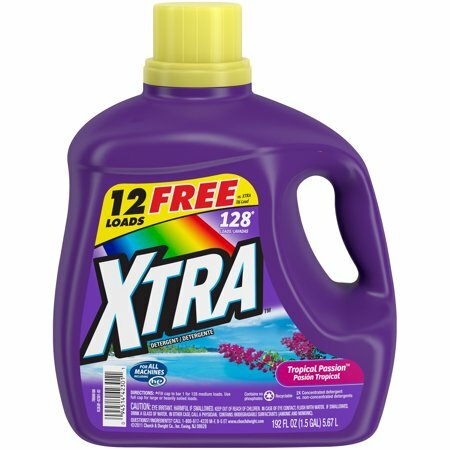 XTRA provides reliable performance and a variety of fragrances at a great value. Our most popular scent Tropical Passion combines tropical fruits with fragrances of island blossoms and ocean driftwood, that will make your clothes smell fresh and tropically clean. Contains: Biodegradable surfactants (Anionic and Nonionic). Caution: Eye Irritant. Harmful if swallowed. Keep out of reach of children. In case of eye contact, flush with water. If swallowed, drink a glass of water. In either case, call a physician. Instructions: Fill Cap to approximately bar 1 for medium loads. Use full cap for larger or heavily soiled clothes. As washer fills with water, add Xtra, then add clothes. excellent for laundry at a great price!